This paper focuses on whether computer technologies could help to create a better learning environment for FL vocabulary learners in China, activating their utilization of various vocabulary learning strategies and thereby enhancing self-directed vocabulary learning (SDVL). A vocabulary learning system called Learning Vocabulary In Domain was developed especially for this research purpose. In the judgmental analysis, students’ satisfaction levels to the vocabulary learning conditions under the computer-based mode and paper-based mode were statistically compared and discussed. As a result, the CALL mode was more favorable to the students during their self-directed learning. The superiority of CALL was further reinforced by the empirical analysis of comparing the students’ vocabulary performances under the two learning modes. Vocabulary knowledge is one of the most important factors in achievement for FL learners. The degree of vocabulary acquisition affects the accuracy and efficiency of language communication directly, including language comprehension and production. With the gradual recognition of the importance of vocabulary in language communication, a research interest in vocabulary learning and teaching has grown since the 1980s. “Vocabulary acquisition research has established itself as a central research focus for language acquisition researchers” (Henriksen, 1999, p. 303). Research has shown that vocabulary knowledge is a key indicator of overall language ability and that vocabulary learning is relevant to the development of all language learning skills. For instance, vocabulary learning is strongly correlated with reading comprehension (Nagy, 2005; Nassaji, 2003; Nation, 2001, 2006; Qian, 2002) and quality writing (Laufer & Nation, 1995; Lee, 2003; Lee & Muncie, 2006; Muncie, 2002). However, despite its great importance, vocabulary always presents one of the greatest challenges for FL learners. Although being eager to learn as many words as they can and take in a large amount of knowledge of these words in depth, FL learners have the most trouble in vocabulary learning and express a strong desire for good learning abilities. Regarding FL teaching within higher education in China, teachers’ explanations of vocabulary in class is usually confined to a limited time or a particular context. As a result, a large amount of remaining work on vocabulary learning is left to students’ out-of-class time. According to a study on Chinese college students’ self-directed vocabulary learning (SDVL) (Wu, 2011), 68% of the students declared that the time they spent on vocabulary learning out of class was more than double that spent in class. Consequently, it is important that students develop autonomy so that they might effectively take charge of their own vocabulary learning outside of class. However, research (e.g., Liu & Zhang, 2005; Wang, 2002; Wu & Wu, 2008; Xu, Peng, & Wu, 2004) indicates that Chinese college students depend too much on their teachers, are used to being passive recipients, and lack autonomy. The majority of them engage mostly in rote memorization with word lists and mechanical drills during their SDVL. With only mechanical repetitions and drills, the depth of processing and elaboration of words are obviously restricted at different stages of vocabulary learning. Therefore, long-term word retention is hard to achieve, to say nothing of good word transfer. This way of learning vocabulary in self-direction is most likely to result in a decrease of both learning interest and efficiency. Therefore, in order to address the problem described above, this paper will focus on the improvement of self-directed vocabulary learning through CALL so that students can learn vocabulary independently as well as successfully. With the rapid development of computer technology, CALL has been widely applied in both FL teaching and learning. It has also shown great potential in the field of vocabulary learning in terms of three computer roles, i.e. tutor, tool and medium. Its unique features such as providing numerous authentic resources conveyed with texts, images, audios and videos, immediate feedback, on-hands learning tools and authentic online interactions are considered favorable to both learning efficiency and learner autonomy. Therefore, the application of CALL is expected to facilitate the compilation of various vocabulary learning tasks to promote students’ utilization of various vocabulary learning strategies through the advancement of learning conditions and ultimately enhance self-directed vocabulary learning. CALL is tightly connected to other disciplines, such as cognitive psychology, artificial intelligence, course design, human-computer interaction and SLA. CALL may be defined as “the search for and study of applications of the computer in language learning and teaching” (Levy, 1997, p. 1). The academic literature has recognized the field of CALL for about five decades. It has undergone a series of phases that have been directly determined by both the level of advancement of technology and the type of methodology prevalent. From recent literature, it is found that computer technology has been gradually integrated into language education with its applications in various aspects. Many studies (e.g., Kern, 2006; Levy, 1997; Warschauer & Kern, 2000; Wu & Wu, 2008, 2009) report that the integration of CALL into L2 learning and teaching is both preferred and effective. In fact, CALL has also been applied widely in facilitating vocabulary learning with richer linguistic or non-linguistic support from diversified perspectives. “In the tutor role, computers can provide instruction, feedback, and testing in grammar, vocabulary, writing, pronunciation, and other dimensions of language and culture learning” (Kern, 2006, p. 191). The findings in research by Tozcu and Coady (2004) demonstrate that explicit instructions for high-frequency words in English on the computer result in a significant increase in vocabulary knowledge. Furthermore, Coll (2002) writes that hypermedia-based instruction may achieve an effective learning environment for building vocabulary. Christensen, Merill and Yanchar (2007) agree that students perform well with computer-based drill and practice programs in both breadth and depth of vocabulary knowledge. Zapata and Sagarra (2007) find that the students completing their homework with an online workbook outperform those working with a printed one after six and eight months of exposure to the learning environment. In addition, Merrill et al. (1996) argue that computer-based drill and practice programs can tailor the practice to the needs of individual learners and increase retention by providing short-spaced reviews. Moreover, CALL can provide the immediate and individualized feedback to promote learners’ motivation to make more efforts on recalling or reproducing newly learnt words. As a result, with a high motivation, learners may increase their studying time for language learning, and vocabulary acquisition is enhanced. Ellis (1995) concludes, “Computers can structure training, practice, and testing to optimize the rate of vocabulary acquisition” (p. 123). Nowadays, some researchers have attempted to create CALL programs on vocabulary learning, emphasizing the role of a computer as a tutor. For instance, the program CAVACO (Groot, 2000) simulates three stages of acquiring a new word in the mental lexicon, namely noticing, storage and consolidation. In addition, the research project of Basanta (2004) reports the pedagogical process of the design and development of an online vocabulary modular course ADELEX for assessing and developing lexical competence. Chan and Liou (2005) investigate the influence of using five web-based practice units in the format of textual explanation, semantic grid analysis, a bilingual concordancer called TOTALrecall and interactive exercises. The results show that learners make a significant collocation improvement after this online practice. The role of the computer as a tool has revealed its significant prominence in vocabulary learning. “In the tool role, computers provide ready access to written, audio, and visual materials relevant to the language and culture being studied” (Kern, 2006, p. 191). Certain conditions have been identified in the CALL environment that make lexical learning easier: when a word is presented in the context of a sentence with cues indicating synonyms and definitions (Kolich, 1991); when a word is presented in the form of text-related images instead of video and text or text only (Chun & Plass, 1996); and when electronic dictionaries as on-line reference tools help students access target vocabulary (Wang, 2012). Besides, a large number of CALL studies (Abraham, 2008; De Ridder, 2002; Lenders, 2008) have discovered that recall is enhanced and retention is superior when word meanings are provided with electronic glosses. The glosses can be made much more informative and attractive than traditional word entries. Moreover, an important tool for vocabulary learning is the concordancer, which is “a sophisticated computer retrieval program with a large amount of information in the form of computer language corpus accessible to encourage data-based inductive learning” (Chan & Liou, 2005, p. 233). Horst, Cobb and Nicolae (2005) argue that concordancing can provide learners with rich semantic, syntactic and collocational information about a new word presented in different contexts. Learners first guess the meaning of a concordanced word, then make a hypothesis about its meaning and finally confirm the guess by checking an online dictionary. Bloch (2009) discusses the use of a web-based concordancing program to help students choose reporting verbs properly. Online activities with a concordancer can offer richer input and encourage deeper processing. In addition, many software tools can facilitate vocabulary learning. WordNet is an online lexical reference system whose design is based on psycholinguistic theories of human lexical organization and memory (Beckwith, Fellbaum, Gross, & Miller, 1990). As a lexical learning environment for French as a second or foreign language, the ALEXIA system (Chanier & Selva, 1998) describes a network module, plotting the graphs of lexical semantic relations automatically. A computer program called TextLadder (Ghadirian, 2002) can select, screen and arrange texts to solve the problem of how to bring FL learners with limited vocabulary knowledge to the point where they can comprehend authentic texts in a target field adequately. Huang and Liou’s Textgrader (2007), an online extensive reading program, draws on Ghadirian’s ideas for creating supportive conditions for vocabulary acquisition but makes some improvements. It is expected that all the media can be used for vocabulary learning. Then, learners can negotiate meanings and solve problems in word learning with their teachers, peers and even native speakers collaboratively. Although the applications of CALL in vocabulary learning have emerged in various aspects, there are still a few noticeable problems. First, vocabulary learning is often seen as a sub-component of a CALL program, particularly a commercialized product. Such a program is often criticized for its lack of a solid pedagogical basis and its unhelpfulness to learners’ individual needs. “Given their general lack of research basis as well as the comparatively small amount of time and space devoted, the quality of the vocabulary learning resulting from the utilization of these programs is often disappointing” (Ma & Kelly, 2006, p. 19). Moreover, most studies only emphasize the effect of CALL on one particular aspect of vocabulary learning. In other words, few studies make a holistic and comprehensive application of CALL in its overall aspect. Third, most current projects focus solely on drill and practice, which isolate words being learnt and do not provide adequate contexts. Then, cognitive processes cannot be involved sufficiently. By viewing numerous vocabulary learning websites, we find that only a few of them offer multiple contextualized examples of target words, such as the Compleat Lexical Tutor (Cobb, 2004), the Virtual Language Centre (Greaves, n.d.) and Gerry’s Vocabulary Database (Luton, 2000). With the problems discussed above, learners cannot be highly motivated and effectively guided to achieve success in vocabulary learning through CALL. Therefore, based on the unique features of CALL in supporting learner autonomy (Blin, 1999; Gu, 2001; Littlemore, 2001; Wu & Wu, 2008, 2009), what is urgently needed is to fully explore the potential of CALL in its overall aspect to a self-directed vocabulary learning environment. An empirical study was conducted in order to discover whether the application of computer technology could significantly enhance college students’ use of vocabulary learning strategies and improve their self-directed vocabulary learning in comparison with the paper-based environment. Two kinds of learning environments were created for the purpose of the study. In the first environment, students used a vocabulary learning system including diversified and meaningful learning tasks. In the second environment, students were given a printed material displaying almost the same vocabulary tasks which they could complete as they normally did. The research objective was expected to be achieved by comparing students’ actual use of vocabulary learning strategies and their performances in the two learning environments. 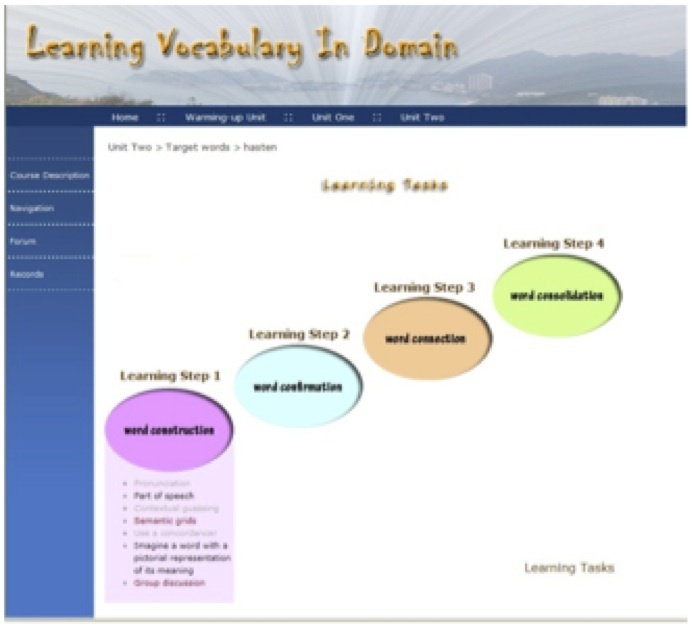 A vocabulary learning system called Learning Vocabulary In Domain (Figures 1 & 2) was developed to help students discover and construct new word knowledge in an authentic environment based upon their existing mental lexicon, while working either individually or in collaboration with others, in order to achieve successful self-directed vocabulary learning. The target words in the system were categorized into three units, belonging to the domains of “Dwelling”, “Happy-Sad” and “Walk” respectively (Trump, Trechter, & Holisky, 1992). 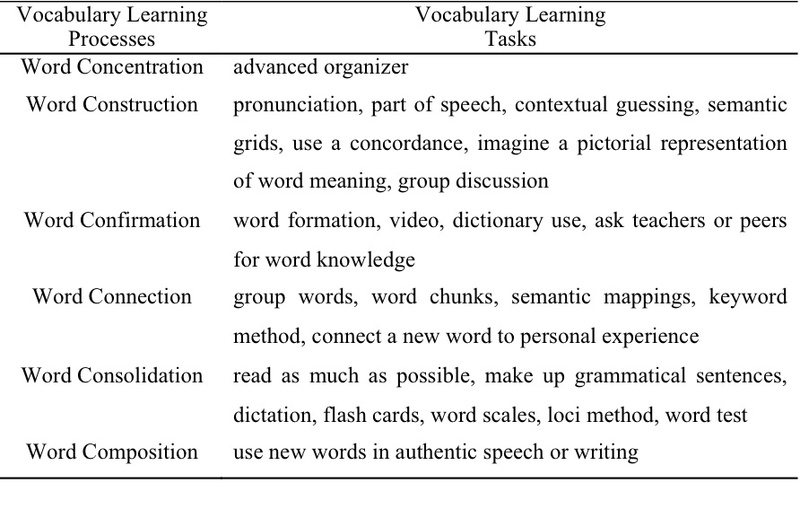 Diversified and meaningful computer-based learning tasks (Table 1) based on those words were arranged systematically according to newly-designed vocabulary learning processes (Wu, 2012), which are expected to stimulate various processing-involved and interactive vocabulary learning strategies for the improvement of self-directed vocabulary learning. Regarding the printed material, it offered almost the same tasks along the same vocabulary learning processes. The participants in this study were 61 freshman students from a science and engineering university in China. They were all non-English majors selected randomly from about 4,000 freshmen. 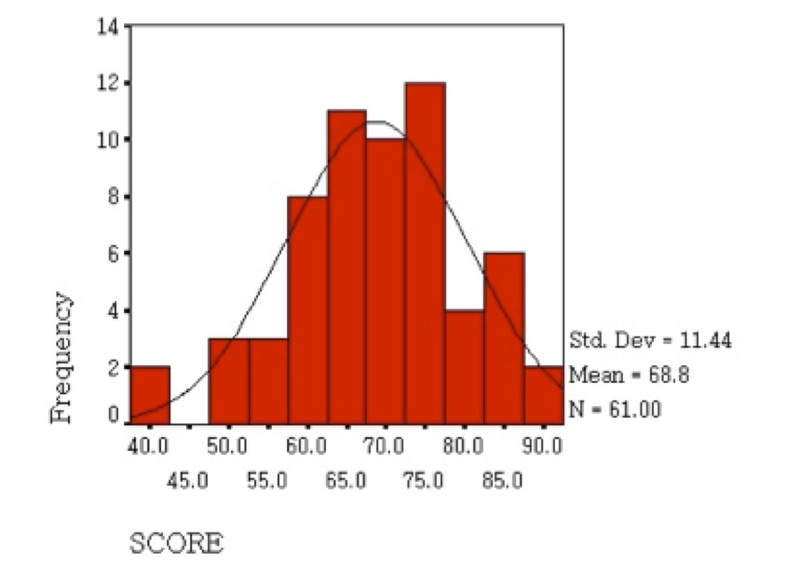 The distribution of their English scores in the placement test which was held immediately after their college entrance is shown in Figure 3. As can be seen from the histogram, although it is skewed to the left (skewness value=-0.424<1), the skewness was not very strong. Therefore, the participants selected generally represent all students in that grade and on a larger scale those at similar science and engineering universities in China. For the purpose of achieving the research objective, the participants were divided into two groups and then assigned randomly to use the self-directed vocabulary learning system and the printed material respectively. In order to ensure the validity of the research, the English scores of the two groups in the examination immediately after college entrance were compared by an Independent samples t-test. The results in Table 2 reveal that the mean score was 69.61 (SD = 12.32) for the computer-based group and 67.90 (SD = 10.59) for the paper-based group. These group means were tested using an Independent samples t-test, and this difference was found to be non-significant, t (59) = -.581, p = .563. It implies that the two groups demonstrate a similar language proficiency level before the start of the experiment. In addition, students’ performances in the pre-test that checked their initial knowledge of the target words in the intended materials were also compared between the two groups by using the Independent samples t-test. It turned out that, as shown in Table 3, the mean score was 19.19 (SD = 6.41) for the computer-based group and 19.17 (SD = 7.55) for the paper-based group. Using the Independent samples t-test, there was no detectable difference, t (59) = -.015, p =.988. Meanwhile, the students in both groups were found to be unfamiliar with the target words. The comparisons above indicate that the two groups were qualified to participate in the experiment. As suggested by Chapelle (1999, 2001), a comprehensive CALL evaluation should include both judgmental and empirical analyses. The former focuses on the characteristics of the software and tasks in terms of criteria drawn from SLA research, while the latter stresses data collection to display the details of CALL use and learning outcomes. With respect to this study, the judgmental analysis was conducted mainly via a questionnaire survey to discover students’ actual use of the designated materials. The empirical analysis was undertaken through comparisons of students’ performances to unfold the effects of CALL on self-directed vocabulary learning. Judgmental analysis. A questionnaire (see Appendix) was the instrument chosen for the judgmental analysis. The questionnaire is composed of two parts. The first part is concerned with personal information, covering gender, the English score on the College Entrance Examination and experience with electronic language learning tools. The second part is aimed at finding out the effect of the material on students’ actual use of different vocabulary learning strategies in their self-directed vocabulary learning. For the convenience of later statistical analyses, a 7-point Likert scale was adopted to show the effect of using the material from “not effective at all” to “extremely effective”. Interviews and observations were also employed as instruments in the judgmental analysis. They were expected to provide more detailed information about students’ actual use of the designated materials. Empirical analysis. Three vocabulary tests, namely the pre-, post- and delayed tests were designated as instruments to compare students’ performance. The participants were not informed in advance of the post-test immediately after the treatment and the delayed test two and a half months later. Therefore, the two tests were designed to be almost the same as the pre-test, with some changes only in the sequence of question items. The test mainly checks the participants’ vocabulary knowledge in three essential aspects, i.e. word form, meaning and usage. It is composed of five parts: 1) Dictation; 2) Choose the correct spoken forms of target words and write out their L1 translations; 3) Find out the synonyms of target words; 4) Fill the gaps of contextual sentences with target words; and 5) Make up grammatical sentences with target words. Importantly, for the purpose of ensuring the validity and reliability of both the questionnaire and the test, both of them were discussed with two professors who are engaged in the study areas of CALL and language testing respectively to make sure that the questionnaire or test items are accurate, necessary and consistent. Also, six college students took the questionnaire survey and the test prior to the participants. They were then revised accordingly, such as selecting more appropriate words for item descriptions, adding items neglected while being crucial for the research purpose and removing items repeated or irrelevant to the research purpose. The questionnaire survey was conducted at the end of the experiment, and the questionnaire was sent to 61 participants by the researcher as a tutor in the Learner Autonomy Center (LAC). All participants gave valid responses. Then, the raw data collected from the questionnaire survey were analyzed using SPSS. Cronbach’s alpha was employed to test the level of internal consistency reliability within the post-questionnaire survey. As a result, an acceptable coefficient was obtained (α=0.825). Comparisons were made between the two groups according to the data collected from the questionnaire survey to determine whether the system with the application of computer technology could help students better enhance their strategy use and thus improve their self-directed vocabulary learning. Specially, a comparison of students’ satisfaction levels with the effects of the designated materials on their overall utilization of vocabulary learning strategies was drawn between the two groups to identify whether students were significantly more satisfied with the system than the printed material. As for the interview, six students were randomly selected from the system group. Three students were invited in each half-hour interview. Thus, two interviews were conducted at intervals throughout the relatively late period of the experiment. The questions asked in the interviews along a checklist were based on the items of the questionnaire survey above for the purpose of examining the details of students’ views on strategy use in different learning environments. In addition, the researcher observed the participants studying in the LAC. The observation focused on how participants carried out their self-directed vocabulary learning with the help of the designated materials. A notebook was mostly used by the researcher to take down students’ behavior patterns during their study. In other words, a great emphasis was placed on the behaviors that occurred frequently and distinctively among students. The three vocabulary tests were carried out with the two participating groups before, immediately after, and two and a half months after the treatment. Each test lasted about 45 minutes. Sixty-one valid test papers were collected afterwards for each test. The papers were scored according to the scoring criteria. Then, all the raw data collected from the tests were analyzed using SPSS. Cronbach’s alpha was employed to check the level of internal consistency reliability within the post-test this time. The result indicated an acceptable coefficient (α=0.754). Comparisons were made between the two groups based on their performances in the three tests to discover whether the application of computer technology could significantly enhance college students’ self-directed vocabulary learning. To put it in detail, firstly, the gain scores from the pre-test to the post-test were compared between the two groups by an Independent samples t-test to see whether the gain scores of the group engaging in the system were significantly higher than those of the group studying on the printed material after the treatment. Secondly, the gain scores from the pre-test to the delayed test were compared in the same way to find out whether the students using the system still achieved significantly higher gain scores two and a half months later. The experiment lasted eight weeks in its entirety, including one training week, five learning weeks and two assessment weeks. In the training week, a tutor explained the use of the designated materials to the two groups. During the five learning weeks, the two groups were required to study their materials twice a week, one hour each time in the LAC for Language Studies. During the assessment weeks, the questionnaire survey and some vocabulary tests were conducted. Questionnaire Survey. The results of the comparison between the satisfaction levels of the two groups are listed in Table 4. The mean score (5.20) for the group studying on the system was larger than that (4.87) for the group engaging in the printed material. However, this could not justify that the difference was significantly large. Then, these group means were tested using an Independent samples t-test, and the difference was found to be significant, t (59) = 2.023, p < .05. It means that there was a detectable difference between the satisfaction levels of the two groups immediately after the treatment. That is, the application of computer technology as the only factor differentiating between the system and the printed material had a significant effect in increasing students’ satisfaction levels. In the first interview, students argued for the relatively positive effect of the system on their utilization of various strategies. For instance, one student said, “I favor this system as it can provide immediate feedback with useful phonetic rules or tips to help me understand word pronunciation, which is important for pronunciation accuracy.” Another student added, “The interactive tasks of guessing word meaning from either textual or prolific contexts leave me a deep impression of target words and their distinctive features.” Furthermore, the remaining student emphasized, “The task of semantic mappings encourages me to grasp more words in a particular domain besides its synonyms and antonyms. I also find that the learning tool WordNet is very useful to help me discover these associated words.” Then, in the second interview, the students reinforced the preference for the system as a student mentioned, “I enjoy the latest authentic articles indicating target words from popular online newspapers in the task of reading. They look more attractive than those in the conventional textbooks.” Two other students followed with excitement, “It is quite convenient to dictate myself just with a mouse click on a button and look up a new word and its family members via electronic monolingual or bilingual dictionaries,” and “The computer-mediated task of word test is more favorable than that in the printed material because the feedback with language hints or keys can be offered in real time.” By observation, the electronic notebook provided in the system looked quite favorable to students for their frequent use because they could note down any relevant information about target words immediately, whenever they scanned the material. Additionally, the tasks of asking teachers or peers for new word knowledge and using new words in authentic interactions at the electronic forum could effectively elicit students’ word discovery and production along with less anxiety. Performance Comparison. The results of the comparison of the gain scores from the pre-test to the post-test between the two groups are displayed in Table 4. The mean score (84.71) for the group using the system was larger than that (79.57) for the group taking the printed material immediately after the treatment. However, the Independent samples t-test value for the difference between the two groups was non-significant, t (59) =2.000, p = .050. It reveals that no detectable difference could be found between the gain scores in the two groups immediately after the treatment. According to the results of the comparison of the students’ gain scores from the pre-test to the delayed test between the two groups in Table 5, the mean score (77.32) for the group utilizing the system was larger than that (70.97) for the group adopting the printed material two and a half months after the treatment. Then, these group means were tested using an Independent samples t-test, and the difference was found to be significant, t (59) = 2.480, p < .05. Therefore, it could be said that despite the insignificance shown immediately after the treatment, there was a detectable difference between the gain scores in the two groups two and a half months after the treatment. We could state that the system was significantly more effective in helping students to maintain long-term retention of target word knowledge than the printed material. The result further implies that the effect of computer technology as the only difference between the two materials was enlarged two and a half months later. As mentioned in the literature review, vocabulary learning is usually regarded as a sub-component of a CALL program, and most research studies only investigate the effect of CALL on one particular aspect of vocabulary learning. Thus, few studies make an overall application of computer technology to vocabulary learning. In this study, a system was developed to apply CALL to self-directed vocabulary learning from a comprehensive perspective, and the effect of CALL revealed in the empirical study above ultimately turned out to be significant. As a result, the satisfactory outcomes not only conform to those from the individual applications of computer with its different roles (i.e. tutor, tool and medium) in vocabulary learning, but also show the full potential of CALL on self-directed vocabulary learning. Despite the satisfactory outcomes of computer-assisted self-directed vocabulary learning in this study, some further research needs to be conducted in the future in order to explore more significant achievements in this area. First, a longitudinal study with a longer treatment period could be undertaken if the research conditions allow. This could lead to more interactions with the computer-mediated learning tasks, which may further contribute to their self-directed learning of target words. Moreover, a larger number of target words and more participants involved in the longitudinal study could enable researchers to collect a broader range of data to probe more into details of computer-assisted self-directed vocabulary learning, such as how many word exposures are sufficient for long-term retention of a new word and which aspect of word knowledge, form, meaning or usage, is most improved in such an environment. In addition, it is expected in future research that more advanced computer technologies can be incorporated into the development of the system. Thus, the tasks with a more attractive interface can be designed for strategies such as semantic mappings and word scales, and more interactive tasks can be provided for the strategies like flash cards and the loci method. More importantly, the adaptive nature of CALL may help achieve the individualized learning for students, allowing them to control their learning environment and select the strategies best suited for their learning styles. Nowadays, most college students in China lack learner autonomy and usually learn words by rote memorization and mechanical practice, which is most likely to result in inefficient self-directed vocabulary learning. With its rapid development and wide applications in language teaching and learning, computer technology is expected to improve self-directed vocabulary learning so that students could acquire words more successfully. Therefore, in the present research, a self-directed vocabulary learning system called Learning Vocabulary In Domain was developed. In this system, computer technology facilitates the composition of various learning tasks that activate different vocabulary learning strategies. In the empirical study, it was discovered that the system was superior to the printed material delivering almost the same tasks in helping students enhance their strategy use according to the questionnaire survey. In addition, although there was no detectable difference between the gain scores immediately after the treatment, students using the system retained significantly more knowledge of the target words two and a half months later based on the performance comparison with those studying the printed material. In other words, the application of computer technology as the only difference between the two materials helped students enhance their strategy use, and more importantly, retain the knowledge of the target words for a longer time. Therefore, the efficacy of the developed self-directed vocabulary learning system was justified through the validation of the effectiveness of computer applications. On the whole, in terms of all the aspects above, this study has surely illuminated the direction of future research on both vocabulary learning and FL learning, and future research is expected to make more breakthroughs in the area. The research is sponsored by the Chinese MOE Youth Funds for Research in Humanities and Social Sciences (Grant No: 12YJC740111). Beckwith, R., Fellbaum, C., Gross, D., & Miller, G. (1990). WordNet: A lexical database organized on psycholinguistic principles. In U. Zernik (Ed. ), Using on-line resources to build a lexicon (pp. 211-231). Hillsdale, NJ: Lawrence Erlbaum. Blin, F. (1999). CALL and the development of learner autonomy. In R. Debski & M. Levy (Eds. ), WorldCALL: Global perspectives on computer-assisted language learning (pp. 133-147). Lisse, The Netherlands: Swets & Zeitlinger B. V.
Chapelle, C. A. (1999). Theory and research: Investigation of “authentic” language learning tasks. In J. Egbert & E. Hanson-Smith (Eds. ), Computer-enhanced language learning (pp. 101-115). Alexandria, VA: TESOL. Herring, S. C. (2001). Computer-mediated discourse. In D. Schiffrin, D. Tannen, & H. E. Hamilton (Eds. ), The handbook of discourse analysis (pp. 612-634). Malden, MA: Blackwell. Littlemore, J. (2001). Learner autonomy, self-instruction and new technologies in language learning: Current theory and practice in higher education in Europe. In A. Chambers & G. Davies (Eds. ), ICT and language learning: A European perspective (pp. 39-52). Lisse, The Netherlands: Swets & Zeitlinger B. V.
Merrill, P. F., Hammons, K., Vincent, B. R., Reynolds, P. L., Christensen, L., & Tolman, M. N. (1996). Computers in education. Boston, MA: Allyn and Bacon. Nagy, W. E. (2005). Why vocabulary instruction needs to be long-term and comprehensive. In E. H. Hiebert & M. L. Kamil (Eds. ), Teaching and learning vocabulary: Bringing research to practice (pp. 27-44). Mahwah, NJ: Lawrence Erlbaum. Payne, J. S., & Whitney, P. J. (2002). Developing L2 oral proficiency through synchronous CMC: Output, working memory, and interlanguage development. CALICO Journal, 20(1), 7-32. Trump, K., Trechter, S., & Holisky, D. A. (1992). Walk, amble, stroll: Vocabulary building through domains, level 2. Boston, MA: Heinle & Heinle. Wang, D. (2002). Fostering learner autonomy in college English study. Foreign Language World, 5, 17-23. Wu, J. (2011). Survey on EFL college students’ utilization of vocabulary learning strategies. Fudan Forum on Foreign Languages and Literature, 84-89.